Jasmyne Boswell spent her life seeking truth and following her intuitive heart. That guidance led her to study with many spiritual teachers covering numerous traditions. 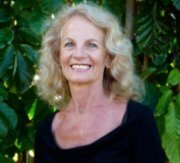 She is co-author of the book The Power of the Sacred Living Letters, has published numerous articles and for many years was a columnist for the Maui Weekly. She currently lives on Maui where besides enjoying the tropical paradise, she teaches at the University of Hawai'i Maui College and leads writing workshops. Jasmyne also coaches individuals interested in writing and transformation.